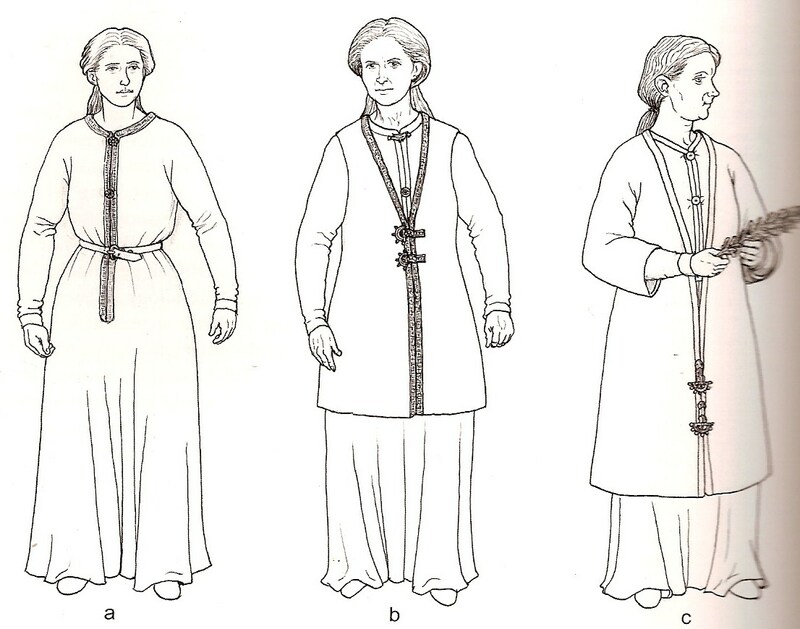 Dress Style III(a in the picture) is described as “a garment with a vertical front opening clasped by two brooches, one at the throat the other centre-chest, and worn with a buckled belt.” For ease of reference I’m referring to this at “the tunic”. 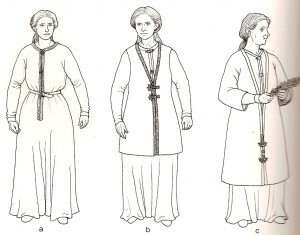 And Dress Style IV(b and c in the picture) is described as “the same as Dress Style III but with the addition of a front-opening coat or jacket on top. The coat/jacket was fastened by a pair of crossways bow brooches, either at the waist or immediately below, the jacket being worn outside the belt. The women used both imported and Kentish-made brooches to fasten these garments and bordered the front edges of the jacket with their Jutish-style tablet weaves.” In some sources this is refered to as a “Frankish coat” and since that’s simpler I think I’ll stick to that as shorthand. See.. now here’s where I admit to what I suppose is a modern bias. When I first look at these Kentish fashions my first thought was that the tunic HAD to have some kind of chemise under it. In fact I accepted it as so much of a fact I didn’t think to question it until I’d spent MONTHS looking into Kentish fashions. So here I am.. months later, finally questioning my assumption. “The evidence” at this point is a skim of quite a few articles/books and a careful review of “Early Anglo-Saxon costume and textiles from Saltwood Tunnel, Kent” by Penelope Walton Rogers and a half-way-done careful review of the clothing evidence from “Buckland Anglo-Saxon Cemetery, Dover Excavations 1994” by Keith Parfitt and Trevor Anderson. The evidence so far is made up of wisps of fibers which have been found on the fronts/backs of the metal items in the graves (Button Brooches, Rectangular Brooches, belt buckles, pins, etc). I do mean wisps. In some cases the “fibers” boil down to 3-4 mm of fibers which are so tiny the weave cannot even be determined. So far I have not seen a single reference to any type of dye testing results on ANY of the fibers(wool, linen, hemp). The evidence so far points to the fact that the “tunic” is made of fine probably tabby linen. I’ve also found some delicious information about button loop closures on these tunics (I’ll write more on that when I actually try making some). At this point the evidence does not point to any tablet weaving on this garment. What the evidence does NOT show is any hint that there might be another garment UNDER the tunic. Point the first: No one in any of the sources I’ve looked at have hinted at a chemise layer.. I just assumed it was there. Point the second: In all cases that I’ve seen so far the tunic layer has been described as fine linen.. BUT there’s been no hint about dyes used. Point the third: Common held belief is that it is very rare to see instances of dyed linen in medieval clothing. Counter-Point the first: Let’s say there *is* a chemise layer. Right now all the evidence consists of scraps of a fiber adhered to metal bits. It’s possible that they didn’t wear a metal bit between the tunic layer and the chemise layer or between the chemise layer and their skin.. so there wouldn’t be any fiber preserved to hint at this chemise layer. This is still waiting on more research.. 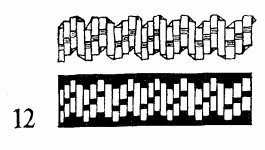 I do know of several examples of bracelets.. and I haven’t yet looked into the fiber evidence on the bracelets to see if those lend any more information to the picture. So.. what if the thing that I’ve identified as the “tunic” is really the tunic/chemise. What if it’s white.. and has 3 fixation points down the front. Honestly I can’t imagine wearing a tunic which is only closed at three places and having bare flesh underneath. I’ve worn button-down shirts.. and gap-osis is epic when you have a button every two inches.. let alone what happens when you have a total of three fixation points (two brooches and a belt). That said.. from a practicality perspective, especially when considering how to facilitate breast-feeding.. having no chemise in the way would seem really convenient. So.. well I guess at this point I’m going to make a new tunic.. split it down the front.. add the spiffy button loops and try wearing it to see how that works out. Maybe my bias is unjustified. We’ll see. I am going to stray from the evidence a bit.. I have a nice hank of gold linen set aside which I want to use for the tunic.. so I’m going to do that instead of using plain white. Nice.. The Kentish have this tunic/coat setup.. and the sources tend to imply that it’s because they do so much trade with the Frankish/merovingians..
I’m bummed that the wrist clasps don’t seem to be used in Kentish area.. but in Anglia and Essex they show up a lot (and they also migrate back to scandanavia.. only there they show up for women AND men). AFAICT they only make sense if you want the wrist opening of the garment to be smaller than the circumphrence of the hand.. ie, you want to be able to put the sleeve on.. and then use the clasp to get the sleeve to fit snug around the wrist. Otherwise there’s no point to them. BUT they do allow you to put the sleeve on.. or to unclasp them and roll the sleeve up (ie, dishwashing etc). So for the Scandinavian ones, are they really men and women? or are these in some of those debatable graves where it was assumed the body was male because there were weapons, when it was really an armed woman? There is so a reason I don’t let myself do more research, I’d go on impossible tangents all the time! I don’t know. I’ve read that they migrate back.. and they’re for men and women but since I’m currently focused on Kentish stuff I haven’t followed up on it. Hello, I came across your post doing my own research on the kentish dress. Doing early 6th century reenactement in Brittany I just made myself a Kentish dress style III, since similar closer systems were found in a grave there. I braced up my courage and wore it without a tunica under it, fearing that my modesty could suffer. It did not. Putting the clasps ( no brooches here but clasps ) far enough on each side of the slit, I managed to keep it closed. It was however quick and easy to open it if needed. The other girl in my group is going to make herself the same dress, since it is so practical for breast feeding. Breast feeding coulf therefere be a could reason to wear such a dress. 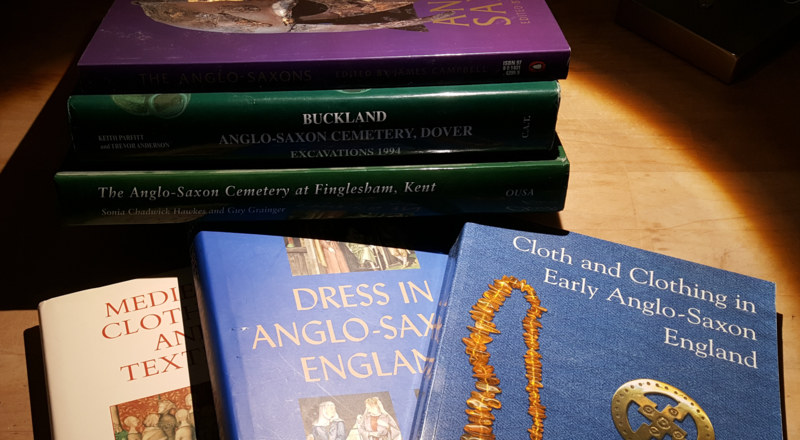 However, I based my recontruction only on Walton-Roger’s book, “clothing in tht early Anglo-Saxon England” and hope to find the Dover-Buckland report to be able to deepen my research on the subject. This is great to hear! Thanks! Oh, looking at the drawing again, I didn’t do the exact same. I stopped the slit at the waist. I believe the slit length is partially conjectural. Based on what I’ve read so far.. they can show that the slit probably continued below the belt because they’ve found evidence of a slit on the back of the buckle used on the belt. But I don’t know they they can prove how far down the slit goes. It might be -just- to the belt.. or it could be quite a bit further.